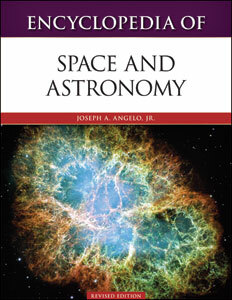 Authored by: Joseph A. Angelo, Jr.
We've come a long way from the days when we traced astrological shapes in the stars and thought comets spelled "disaster." Our knowledge of space and the universe around us has increased dramatically over the centuries, and, with every new venture—from the Mars rover Curiosity's explorations of the red planet to New Horizons's up-close look at Pluto—it just keeps growing broader. Keep track of that expanding knowledge with the Encyclopedia of Space and Astronomy, Revised Edition. Offering a complete, up-to-date presentation of the main concepts, terms, facilities, and people in astronomy, the encyclopedia pays special attention to space-based astronomy and space exploration. Broad coverage includes terms such as astrophysics, planetary engineering, and cosmology, as well as both American and international astronomy and space technology. Encyclopedia of Space and Astronomy, Revised Edition focuses mainly on modern astronomy and space achievements but also includes the most important accomplishments of classical astronomy. The impact of astronomy, astrophysics, and cosmology is presented in terms of the development of the scientific method and also with respect to philosophy. History-related entries trace the evolution of astronomy and space technology from ancient times, and selected entries discuss important observatories and organizations such as NASA, as well as contemporary events. Joseph A. Angelo Jr., Ph.D., is a retired U.S. Air Force lieutenant colonel and is currently an adjunct professor in the science department of Valencia Community College, where he teaches an introductory astronomy course called The Cosmic Perspective. He is the author of many reference books, including the Frontiers in Space set for Facts On File.